Five hours. Five bleeping hours. That is likely to be the difference between the UNLV Runnin’ Rebels becoming the first team in NCAA Division I history to score a 3-pointer in 1,000 consecutive games … and the second. UNLV and Kentucky begin the day with each school having made a trey in an NCAA record 999 consecutive games. It’s a mark Runnin’ Rebel fans have long taken great pride in. Since the 3-point field goal was adopted in 1986-87, UNLV (10-15, 3-9), which hosts San Jose State (12-10, 5-6) in Mountain West Conference play this afternoon at 3 p.m. at the Thomas & Mack Center, has had made at least one 3-pointer in every game it has played. But Kentucky has made a trey in every game it has played since failing to connect beyond the arc in a loss to Seton Hall on Nov. 26, 1988 in the Great Alaska Shootout and caught up to the Rebels thanks to its superior post-season record which has allowed the Wildcats to play in more games since then. The Runnin’ Rebels haven’t played in a post-season contest since their 64-61 loss to Cal in the second round of the NCAA Tournament in San Jose on March 21, 2013. Kentucky, meanwhile, has played in 13 NCAA Tourney games since then. The Wildcats play at Alabama today starting at 10 a.m. on CBS. My guess is future NBA lottery pick Malik Monk, who is averaging 21.9 points and shooting 41.6 percent from 3-point range, will get Kentucky to the coveted 1,000 straight games with a 3-pointer milestone within a few minutes after tipoff. Still, in an otherwise forgettable season, the Runnin’ Rebels can give their fans something to cheer about by at least extending their perfect 3-point shooting mark a few hours later to tie the Wildcats. 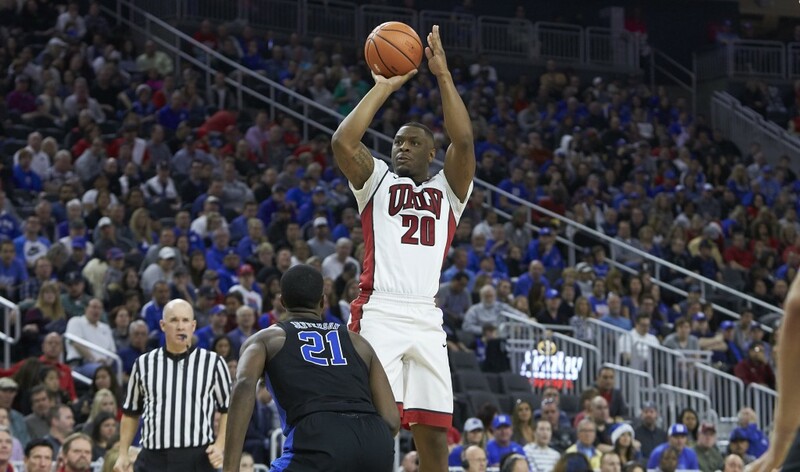 The Runnin’ Rebels will also be trying to snap a five-game losing streak that includes a 76-72 loss to San Jose State in their first meeting on Jan. 28. UNLV leads the all-time series with the Spartans, 35-5, including an 18-1 mark at home with the only loss coming in 1994. UPDATE: Monk nailed a 3-pointer with 15:28 left in first half to make Kentucky the first team to hit a 3-pointer in 1,000 consecutive games.